ANN ARBOR—The fossilized fangs of saber-toothed cats hold clues to how the extinct mammals shared space and food with other large predators 9 million years ago. Led by the University of Michigan and the Museo Nacional de Ciencias Naturales in Madrid, a team of paleontologists has analyzed the tooth enamel of two species of saber-toothed cats and a bear dog unearthed in geological pits near Madrid. Bear dogs, also extinct, had dog-like teeth and a bear-like body and gait. The researchers found that the cat species—a leopard-sized Promegantereon ogygia and a much larger, lion-sized Machairodus aphanistus—lived together in a woodland area. They likely hunted the same prey—horses and wild boar. In this habitat, the small saber-toothed cats could have used tree cover to avoid encountering the larger ones. The bear dog hunted antelope in a more open area that overlapped the cats' territory, but was slightly separated. "These three animals were sympatric—they inhabited the same geographic area at the same time. What they did to coexist was to avoid each other and partition the resources," said Soledad Domingo, a postdoctoral fellow at the U-M Museum of Paleontology and the first author of a paper on the findings published in the Nov. 7 edition of Proceedings of the Royal Society B. 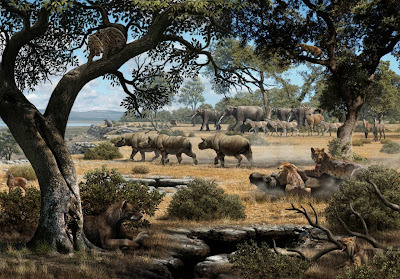 Millions of years before the first humans, the predators lived during the late Miocene Period in a forested area that had patches of grassland. Large carnivores such as these are rare in the fossil record, primarily because plant-eating animals lower on the food chain have outnumbered meat-eaters throughout history. Cerro de los Batallones, where Domingo has been excavating for the past eight years, is special. Of its nine sites, two are ancient pits with an abundance of meat-eating mammal bones. Agile predators, the researchers say, likely leapt into the natural traps in search of trapped prey. "These sites offer a unique window to understand life in the past," Domingo said. To arrive at their findings, the researchers conducted what's called a stable carbon isotope analysis on the animals' teeth. Using a dentist's drill with a diamond bit, they sampled teeth from 69 specimens, including 27 saber-toothed cats and bear dogs. The rest were plant-eaters. They isolated the carbon from the tooth enamel. Using a mass spectrometer, which you could think of as a type of scale, they measured the ratio of the more massive carbon 13 molecules to the less-massive carbon 12. An isotope is a version of an element that contains a different number of neutrons in its nucleus. Carbon 12 and 13 are both present in the carbon dioxide that plants take in during photosynthesis. Different plants make use of the isotopes in different ways, and so they retain different amounts of them in their fibers. When an herbivore eats a plant, that plant leaves an isotopic signature in the animal's bones and teeth. The signature travels through the food chain and can be found in carnivores as well. "This would be the same in your tooth enamel today," Domingo said. "If we sampled them, we could have an idea of what you eat. It's a signature that remains through time." Because the researchers can tell what the herbivores ate, they can surmise what their habitat was like. They believe the animals in this study lived in a wooded area that contained patches of grassland. The cats showed no significant difference in their stable carbon isotope ratios. That means they likely fed on the same prey and lived in the same habitat, but the paper posits that the species each fed on different-sized prey. The findings demonstrate the timelessness of predator-prey relationships. "The three largest mammalian predators captured prey in different portions of the habitat, as do coexisting large predators today. So even though none of the species in this 9-million year old ecosystem are still alive today (some of their descendants are), we found evidence for similar ecological interactions as in modern ecosystems," said Catherine Badgley, co-author of the new study and assistant professor of ecology and evolutionary biology. The paper is titled "Resource partitioning among top predators in the Miocene food web." Other contributors are from the University of California, Santa Cruz, and the Museo Nacional de Ciencias Naturales CSIC in Madrid. The study was funded by the Spanish Ministry of Economy and Competitiveness.